If you are a fan of classic playstation ps1/psx games then you may be willing to play them on your windows pc. Playstation ps1/psx games can be played on pc or laptop by using a playstation ps1/psx emulator. If you have Tekken 3 game disc then you can also play them in the emulator. If you have a USB joystick then you can enjoy ps1 games even more because of the same experience as you feel on a Playstation. But this is not the limit you can even connect your ps3 controller to your pc/laptop which comes with a USB cable to play games, but you need to install drivers for this. In this tutorial you will learn to play tekken 3 ps1/psx game on windows computer/laptop with epsxe emulator and a usb joystick. Playstation PS1/PSX cds or roms. Two usb joysticks for two players or a ps2 controller with usb adapter or a ps3 controller with usb cable.We are using USB joysticks with rumble motors which lest us feel vibrations during gameplay. Download Tekken 3 ISO Rom from internet. Windows 7 or Windows 8 PC/Laptop. 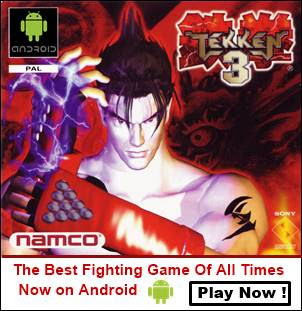 Note: This is a PC tutorial for Tekken 3 if you want to play it on your android phones then see this article. Open ePSXe and goto Config>Video. From the drop down list select “P.E.Op.S. Soft Driver 1.18”. Then click Configure. Here you will see video controls. Select “Fullscreen Mode” to run the games in fullscreen other wise choose “Window mode” to run it in a small window. Also you can specify your resolution. Also choose Color depth to 32 bit. Then click OK,then OK.
To configure bios goto Config>Bios.A prompt box will open. Click “Select” and locate the bios file SCPH1001.bin. You can find this file in ePSXe>bios>SCPH1001.bin. Locate this file and select it then click OK.
Memory cards are in ePSXe>memcards folder. To configure memory cards goto Config>Memory Cards. A prompt box will open,you will see two different memory cards location here. Click select and choose each memory card in different slots. Connect your USB joystick or ps3 controller to pc and install its driver. When it is ready to use you will see a notification in the system tray that your device is ready to use. Do not disconnect it now. Open ePSXe and click “Config”. Then select “Game Pad”. Then click "Port 1" and then select "Pad 1". A gamepad setting wizard will open with a dualshock controller with all button specifications. From the drop down list select “SCPH-1200 DualShock”. Now this is time to configure the buttons and analog stick of your pc joystick. The default buttons are set to keyboard. We need to put pc joystick buttons in this setting wizard instead of keyboard keys. Below is the image of joystick before setting the keys. To assign the buttons first click the buttons with mouse then press the buttons of your joystick. Assign buttons exactly according to the controller layout. Below is the image of the gamepad after setting it up completely. Assign buttons as shown in the image below. Now we have to enable vibrations. You will see several options just next to the controller setup. Click “Type” below the “Rumble” option and select “DX joy1”. Under “Big Motor” select “Constant” and under “Small Motor” select “Sine”. Then click OK. If you have another controller then connect it and repeat the above process for it.But this time goto Config>Game Pad>Port 2>Pad 2. Now setup buttons,six axis controller and the motors for the vibration for the second gamepad.Click OK. For gamepad 2 under “Rumble” select “DX joy2” and motor settings is same. Now click “File” and select “Run ISO”. Then locate the ps1 rom bin/iso/img file select it and click open. If you have an original playstation game cd then insert it in cd/dvd drive then click “File” in ePSXe and select “Run CDROM”. Now enjoy Tekken 3 game with a joystick on your PC. Note : The USB joystick can be used to play any emualtor games like nes, snes, CPS1, sega genesis and neogeo. Awesome! Although everytime I unlock a new character, I lose them when I restart the game. Any advice? In the Game Option go to Memory Card and enable 'Auto Save' to 'Yes'. Then you will not loose any unlocked character. use the iso creator software.. I cannot find ps1 rom.. Please wait for 1-2 days, I am going to upload the file on google drive. I'll post the link here. First download the rom and then follow the tutorial. Use google to find PS1 roms.